Roger's Access Blog: Access 101: What is an Index? Access 101: What is an Index? An index is a method of cataloging the records in a table to increase the speed and efficiency of retrieving them. You can think of it as a library card catalog. If the stacks in a real-world library represent your table, the library card catalog is the index. The library card catalog stores just the information necessary to identify a particular book: author, title, and genre, plus a number that identifies where the book can be found in the stacks. An index works the same way. It stores the value of a field or combination of field and the location of each record that match it. With this information, a query that sorts or searches on the indexed field(s) can go directly to the records. Without it, it has to start at the beginning of a table and look at each record until it finds the ones it wants. There are a number of different kinds of indexes: simple indexes, multi-field indexes, unique indexes, and clustered indexes. Simple indexes are indexes on a single field. They may or may not allow duplicate values. Their main use is for searching and sorting records in a table. Multi-field indexes are indexes across multiple fields. These also may or may not allow duplicate values. This is different than having simple indexes on multiple fields. In a multi-field index, the combination of records is indexed. Unique indexes do not allow duplicate values. They may be either simple or multi-field. 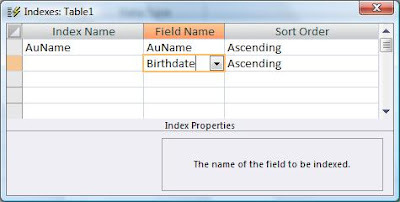 If it is multi-field, it will allow duplicates in individual fields within the indexed fields, but it will not allow a duplicate across the all of the fields in the index. This is useful to make sure you don't have duplicate records in your table. Clustered indexes control how the records are stored in the database. If you have a clustered index, the records will actually be stored in that order. A table can have only one clustered index. This makes sense since records in a table can only be physically stored in one order. Primary Keys are a special type of index. In Access, the primary key is both a unique index and a clustered index. It has one additional property in that no field in the index can be NULL. (see What does NULL mean? ). There can be only one primary key in a table. For more on primary keys, their creation and uses see: What is a Primary Key? How do you create an index? For simple indexes, it's easy. Just go to the Design View of the table and select a field. In the Properties, you'll see an Indexed property. Select one of the "Yes" options. To make it a unique index by selecting Yes (No Duplicates). For multi-field indexes, it's a little more complicated. The simplest thing to do is create a simple index on the first field in your index. Then on the line directly below it, add another field WITHOUT giving it an Index Name. 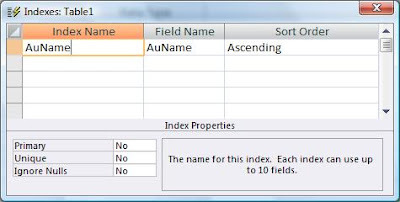 If the Index Name field is blank, Access will assume the field is part of the index directly above it. Add as many fields to the index as you want. From the Indexes Window, you can also set the Unique, Primary, and Allow Nulls properties. A word of warning about indexes. While they do speed up the retrieval of records, they also slow down the insertion of records. Every time a new record is added, all the indexes need to be rebuilt. If you have too many indexes and a lot of records, this can be a problem. Therefore, it is best to just index those fields that really need indexing. These would include fields that you will be sorting or searching on or fields that participate in Relationships or Joins. How Do I Configure My Access Database Start Up? What is a Primary Key?